Access methods, tools, and expertise to understand local and global air quality. For over 35 years, STI has helped government and industrial clients define study objectives and design, perform, and manage air quality studies to meet their research and regulatory needs. Rely on STI’s extensive experience designing, managing, and implementing measurement programs. Facilitate installation, audits, maintenance, and data management and validation for your instrument network. Design and implement monitoring networks to support air quality modeling and address potential health impacts, permit requirements, environmental justice concerns, and source-receptor relationships. Fully understand your local air quality with data validated in real time from well-maintained instruments. Optimize your network for better performance, more efficient site management, and lower costs. Develop a greater understanding of the real-world air quality impacts of your projects. STI has extensive experience working with clients to determine project objectives and performing detailed analyses to meet these objectives. We assess air quality at national, regional, and local levels, including in Environmental Justice communities. Understand the implications of your data using our proven data analysis techniques and in-house, customized tools. STI uses state-of-the-science analysis, statistical, and visualization platforms to assess and communicate ambient air quality data. Reliably assess your source impacts; STI scientists are leading experts in source apportionment, receptor modeling analysis, and modeling tool development. STI develops comprehensive pre- and post-apportionment analysis using the latest statistical applications and models. Solve your compliance and data analysis issues; our proven track record with both industrial clients and regulatory agencies allows us to help clients better understand and navigate the regulatory environment. Develop your data analysis skills through customized training courses that fit your needs and knowledge levels. Training topics span all STI business areas and leverage our expertise across multiple disciplines. Ensure consistency across your air quality monitoring network: manage sites and equipment, document instrument activities and specifications, and quickly access your information from anywhere. Reduce costly downtime; eSIMS provides instant alerts when a site needs attention, so you can diagnose and resolve problems immediately without multiple site visits. Kids Making Sense® is an exciting environmental education program that teaches students about air quality and how to measure air pollution using hand-held sensors and mobile phones, empowering them to drive for positive change in their communities. Visit kidsmakingsense.org. Students participate in hands-on science tasks, discuss their findings with an air quality scientist, and share their data with the global air quality community. They can even use their data to identify local sources of air pollution and take actions to be part of the solution. 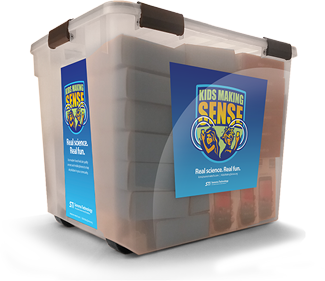 Developed by air quality scientists and educators, and thoroughly tested with teachers and students around the world, Kids Making Sense unites STEM (Science, Technology, Engineering, and Math) education and NGSS (Next Generation Science Standards) with an air sensing system. Educate youth about air pollution at a time when they are forming their driving and consumption behaviors. Increase awareness of your air quality mission among residents who follow science, education, environmental, and public health news. We have conducted Kids Making Sense events across the country, including in schools located in Environmental Justice communities. Select the right instruments to meet your monitoring site needs; from industrial-grade meteorological and air quality instruments to personal handheld air sensors, STI will help you select and manage the equipment throughout your project. Learn about air quality events earlier, gather higher-resolution data over a region, and have the flexibility to easily move monitors between locations. Fully understand your local air quality with data that’s validated in real time from well-maintained instruments. Optimize your network for better performance, more efficent site management, and lower costs. Save money by leasing air qualiy instruments, including gas analyzers, particle instruments, and low-cost sensors. STI's sensor experts will help you through every step of your project. Inform the public about air quality with customized forecasts. We generate air quality forecasts up to six days in advance for regions throughout the country, and provide accurate forecasts for government and industry clients to inform the public, stakeholders, and decision makers of air quality impacts. Use STI’s expertise to design comprehensive air quality and exposure studies and evaluate emission control strategies. We develop highly resolved emissions inventories for criteria pollutants, greenhouse gases, and air toxics for use in modeling and management planning. We use air quality and meteorological modeling to inform forecasting, assess emissions source impacts, and support control measure assessments and other air quality management decisions. Have confidence in your emissions estimates. STI prepares high-quality emissions inventories and improves existing emissions assessments by collecting emission factors and representative activity data for a variety of source types. Rely on our expertise to perform meteorological, emissions, and photochemical modeling to understand air quality impacts on regional and national scales. Using EPA-approved models, we work with clients to evaluate air quality for single-source impact assessments, SIP development, exceptional event demonstrations, and policy analyses. Prepare emissions data for air quality modeling or other analyses using the latest modeling tools, including MOVES, EMFAC, BEIS, and SMOKE. Evaluate the near-field air quality impacts from stationary sources and transportation projects. We use a variety of dispersion models to help our clients perform human health assessments, conduct PM hot-spot analyses, and evaluate air quality in Environmental Justice communities. Leverage our technical expertise to solve your compliance issues. STI has worked successfully with both industrial clients and regulatory agencies for over two decades; our proven track record engenders a high level of trust in our analyses and allows us to help clients better understand and negotiate the regulatory environment. Use our tools and experience to prepare PM and ozone exceptional event demonstrations that meet EPA requirements. Resolve your issues with our technical analysis and expert testimony support for environmental litigation cases. Make more informed management decisions using customized software to better understand and reduce air quality impacts. STI develops, manages, and enhances software tools, decision support systems, and applications that are customized to meet our clients' scientific goals. Engage with the public to better communicate your environmental information with tailored outreach services, websites, and apps. Reach a larger audience with environmental information anywhere, at any time, on any device. Communicating real-time air quality health information is key to effectively engaging the public; STI helps clients provide visually compelling, clear, and concise websites, apps, and widgets to dramatically increase public awareness. Reach your community with strategic visual design products that engage, inform, and inspire. STI collaborates with clients to meet scientific and public outreach needs by bringing clarity and context to your information.